2Mlle Libert était d’un caractère modeste et timide: elle communiquait volontiers ses découvertes aux savants qui l’encourageaient et qui lui semblaient seuls capables de les apprécier et de les publier. Elle ne croyait pas, tant sa réserve était profonde, qu’elle put elle-même prendre rang parmi les auteurs: elle aimait la science pour les émotions intimes qu’elle fait naître, comme on aime le bien pour éprouver le bonheur de le pratiquer (Morren 1868, p. 9). 3Miss Libert was of a modest and shy disposition; she readily communicated her discoveries to the scholars who encouraged her, and who alone seemed to her capable of appreciating and publishing them. She did not believe, so deep was her reserve, that she herself was able to rank among the authors: she loved science for the intimate emotions to which it gives birth, just as one can experience happiness by doing good. 5Libert maintained her reserve in regard to publishing until 1820, when she received another eminent botanical visitor at Malmedy, the Frenchman Jean-Baptiste Bory de Saint-Vincent (1778–1846) (Fig. 3). As a young man, Bory was a member of Nicolas Baudin’s (1754–1803) exploring expedition to Australia in 1798 (although he left the expedition in Mauritius). On his return to France, Bory supported Napoleon and, as a consequence, was proscribed after the Bourbon Restoration in 1815. 6Moving frequently to avoid being captured by authorities, Bory was finally given permission to reside in Brussels, where he became gravely ill. In August 1820 he was advised to ‘aller prendre les eaux’ (take the waters), and opted for Chaudfontaine, between Liège and Spa, an area that he knew would also offer him opportunities to botanise, and to meet Libert. Afterwards he was happy to write to a friend that the trip had eased his gout, yielded a rich store of rare plants, and added that, ‘Ces fanges de Malmedy sont bien curieuses’ (the bogs of Malmedy are very curious) (Lauzun 1908, p. 224). 8According to Édouard Morren, Bory had been especially taken with the liverworts around Malmedy. Responding to this interest, Libert showed him a manuscript description of a new genus in this group that she had named for her first mentor, Lejeune (Lejeunia Lib.—now conserved with the spelling Lejeunea)1 (Morren 1868). As a co-editor of Annales générales des sciences physiques in Brussels, Bory was in a position to reassure Libert that her description was worthy of publication and to facilitate its appearance in his journal. 10Je dédie au savant et modeste auteur de la Flore de Spa, M. le docteur Lejeune de Verviers. J’ose espérer que les botanistes daigneront, en confirmant ce genre que je ferai connaître ici par anticipation, lui conserver un nom déjà distingué dans la science des végétaux (Libert 1820, pp. 373–4). 11I dedicate [the genus] to the learned and modest author of the Flore de Spa, Dr. Lejeune of Verviers. I dare to hope that botanists will deign, by confir-ming this genus that I will make known here in advance, to keep a name already distinguished in the science of plants. 12Nevertheless, as Pender observes in the context of early modern women authors, Libert’s words can be seen as ‘a calculated display of modesty’ (Pender 2012). In venturing into print she was, in fact, daring to offer an original scientific opinion, and to associate her discovery with the name of an eminent scientist. 15Mademoiselle Libert en a découvert une espèce fort élégante dans les envi-rons de Malmédy; nous l’avons communiquée à Agardh qui lui a conservé le nom de Libertiae par lequel nous la désignâmes le premier (Bory de Saint-Vincent 1826). 16Mademoiselle Libert discovered a very elegant species of algae in the neighbourhood of Malmedy; we have communicated it to Agardh, who has kept the name of Libertiae, by which we first designated it. 17Most novel names coined by Libert among fungi were based on the host, but other eponyms named by her include the liverwort Jungermannia dumortieri Lib., for Barthélemy Charles Joseph Dumortier, and the fungal genus Dezmazierella Lib. for Jean Baptiste Henri Joseph Desmazières. By honouring colleagues in new names, and being honoured in return, Libert was participating in a tradition of eponymy that had been established by Linnaeus at the commencement of modern binomial nomenclature (Garrison 1915; Maroske & May 2017, p. 72). 20Les descriptions les plus exactes et accompagnées des figures les plus parfaites laissent encore quelque chose à désirer à celui qui veut connaître complètement un être naturel. Ce quelque chose, que rien ne peut suppléer, ne s’obtient que par l’autopsie ou la vue de l’objet lui-même … (Candolle 1819, p. 316; Libert 1830). 23Keen to encourage Libert, Lejeune either agreed, or offered, to edit the exsiccata, an arrangement she was initially very pleased to countenance in order ‘pour voir encore une fois nos noms figurer ensemble’ (to see our names once again appearing together) (see Appendix 1). In December 1829, she sent him the manuscript of the first fascicle for feedback, and with a view to having him write a prospectus to advertise the work. 24In 1880, the botanist and mycologist Casimir Roumeguère (1828–1892) published two letters from Libert and Lejeune’s exchanges about the first fascicle (Roumeguère 1880), and these are translated into English here for the first time. Those letters were also published by Lawalrée (1957), together with several other letters and documents. The first letter, written by Libert, constitutes a powerful contradiction of her carefully curated public image. In place of the language of deference, she rejects Lejeune’s critique of her work as ‘capable … de déplaire extrêmement’ (extremely disagreeable). She accuses him of drawing attention to how little she knew a decade ago, suggesting that self-education and isolation may have led her to make mistakes, and that her specimens were vulnerable to plant-eating insects. In effect, her letter can be read as chiding Lejeune for taking the rhetoric of modesty too literally. ‘Je le demande à tout homme sensé’ (I ask any sensible man), she declared, abandoning her ground as a woman, ‘pourrait-on parler d’un auteur, que l’on veut mépriser, sur un ton plus ironique’ (could one speak of an author, whom one wants to despise, in a more ironic tone?). 26Il faut convenir que vous êtes d’une susceptibilité accablante pour un ami qui vous confie ce qui lui passe par la tête, à la vérité peut être trop brusquement, mais pensez donc qu’un homme qui pendant toute une journée épuise ses moyens physiques et moraux près des malades et de leurs alentours peut bien écrire à un ami philosophe, mais doit se garder dans cette disposition d’esprit d’écrire à un prince qui le protège, s’il ne veut courir les risques d’entrer en disgrâce! (Appendix 2). 27It must be acknowledged that you are excruciatingly sensitive towards a friend who sends you what passes through his mind, to tell the truth [,] perhaps too bluntly, but think however that a man, who every day expends all his physical and emotional energies in the presence of the sick and their surroundings, cannot well write to a scientific friend, but must put himself in the spirit of writing to a prince patron, if he does not wish to risk falling into disgrace. 28In publishing these two letters Roumeguère insisted that Libert’s expression of forceful rhetoric was an aberration in a relationship with Lejeune that lasted nearly half a century: ‘On est étonné de voir sortir de sa plume un tel flot de mauvaise humeur, qu’un écart regrettable de langage, qu’une restriction injuste et trop hatée semblent cependant très-bien excuser.’ (One is astonished to see such a flow of bad humour come out of her pen, which a regrettable difference of language and which an unfair and too hasty judgement [by Lejeune] seem however to excuse) (Roumeguère 1880). This statement, however, is contradicted by Lejeune himself who hints at ongoing tensions in his letter: ‘Depuis 15 ans, vous m’accablez chaque fois que vous me donnez une de vos découvertes en me recommandant de ne pas vous tromper, de garder cela en silence’ (For fifteen years, each time that you give me one of your discoveries, you importune me not to deceive you, [and] to keep them secret.) (Appendix 2). Moreover, Roumeguère’s decision to publish Libert’s angry letter meant that doubts about her modesty were now on the public record. 29Establishing the impact of Roumeguère’s disclosures on the private opinions of cryptogamic colleagues about Libert’s character is beyond the scope of this article. Nevertheless, the historian Joseph Beaujean found enough evidence during his researches into Belgian botanists to conclude that Libert had many disputes with Lejeune, attributing them to her not having an easy personality (Beaujean n.d.). Libert’s letter in Appendix 1, however, suggests that she was angry with Lejeune because his emphasis on her isolation from scientific centres and her lack of formal education had the potential to undermine her reputation for being talented and sales of her exsiccata. A letter from Libert to Desmazières, written end 1828, already showed the sometimes tense triangular relationships between the Malmedian botanist, and her mentors (Lawalrée 1955). 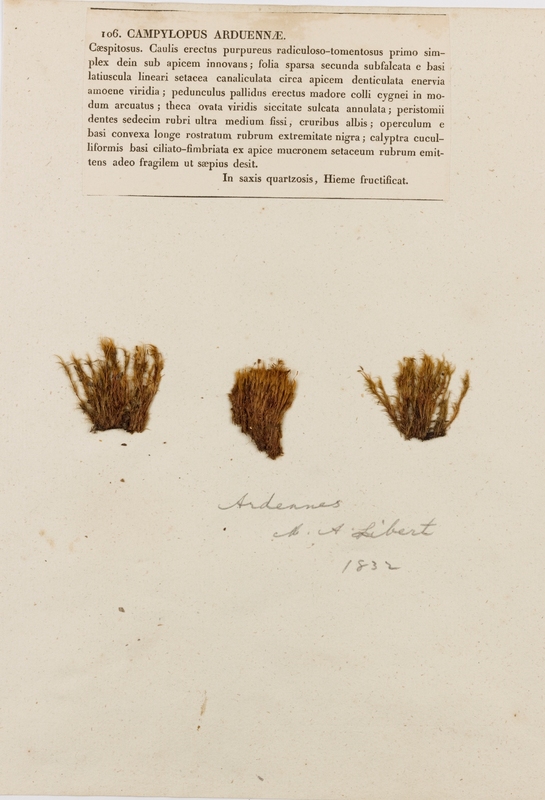 31Between 1830 and 1837, Libert issued four fascicles of her exsiccata Plantae cryptogamicae Arduenna, each with one hundred specimens. In these published fascicles, Libert introduced more than 200 new taxa, including numerous new species and the genera Ascochyta Lib. (in which she introduced 34 species), Aulographum Lib., Cheilaria Lib., Discosia Lib. and Dothichiza Lib., and consequently many of the sheets in the exsiccata are type specimens. We have located 25 sets of her exsiccata (Table 1); with MEL being the only repository in the southern hemisphere. 33TL2 = Stafleu & Cowan (1981). For locations indicated by Mel’nik (2000), species of Ascochyta from Libert’s exsiccata are cited as being in the respective herbaria, but confirmation is required that the whole set is present. Because her exsiccata contains a mixture of taxonomic groups, some sets may be split between present-day botanical and mycological institutions, as appears to be the case for DAO and DAOM, and possibly for US and BPI. 34The new taxa are accompanied by descriptions on the labels, meaning that the new names are published in the exsiccata. 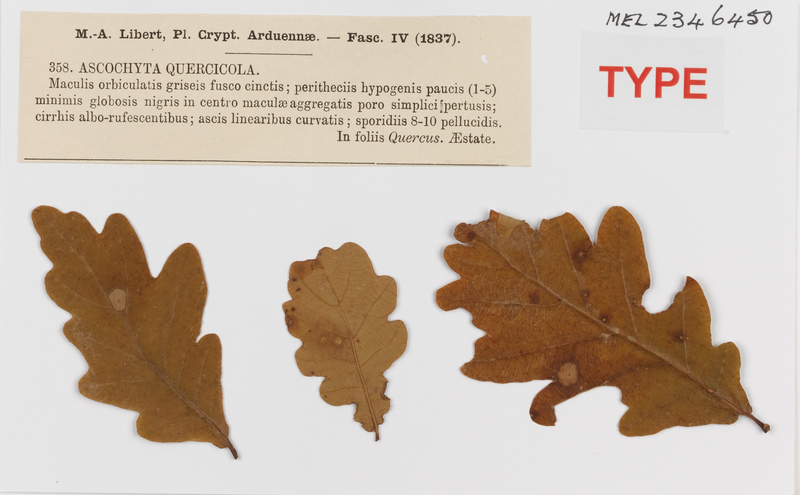 Scanned images of collections from Plantae cryptogamicae Arduenna are available at JSTOR Global Plants (Anon n.d.d), for a limited number of sheets from the sets at G, MEL and US. Labels usually include, along with the name and description, the name of the exsiccata as printed text, along with the fascicle number and date, but for collections of the first three fascicles in MEL, there is a pencil annotation ‘Ardennes, M.A. Libert’ and the date, also in pencil (Figs 4, 5). 35FIG. 4. – MEL specimen of Ascochyta padi Lib., Pl. Crypt. Arduenna. No. 153 (Reproduced with permission from the Royal Botanic Gardens Victoria). 36FIG. 5 – MEL specimen of Campylopus arduennae Lib., Pl. Crypt. Arduenna. No. 106 (Reproduced with permission from the Royal Botanic Gardens Victoria). 37Specimens from the last fascicle at MEL have the name of the exsiccata on the printed label (Fig. 6). We note that there is some variation in the printed labels, with two examples of No. 43, Sphaeria asteromorpha Lib., held at G (G 266344 and G 266345) differing in the layout of the text of the description. 39Libert is known to have collected material for further fascicles, preparing descriptions under unpublished names, but these fascicles did not eventuate. Libert’s obituarists lamented her inability to complete the Plantae cryptogamicae Arduenna, but did not offer any explanation (Dumortier 1865, p. 407; Roumeguère 1880). Libert’s herbarium is now at BR, from which remaining specimens were distributed as ‘Reliquae Libertianae’ (see Stafleu and Cowan 1981, p. 6). 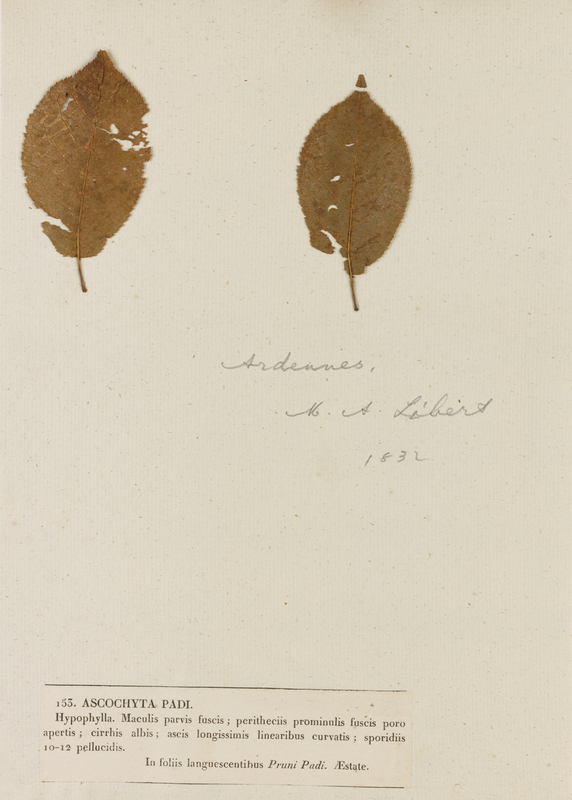 Many of the remaining novelties in Libert’s herbarium were subsequently described after her death by Casimir Roumeguère (1828–1892), Pier Andrea Saccardo (1845–1920) and Felix von Thümen (1839–1892) in a series called Reliquae Libertianae (see Roumeguère 1880). There were sufficient duplicates for von Thümen to include Libert material in his exsiccata Mycotheca Universalis. 1 The spelling as used by Libert, Lejeunia is allowable under the Code (Turland et al. 2018), because it was based on the latinization Lejeunius. Nevertheless, the name was altered to Lejeunea by most botanists from the late nineteenth century, and this latter spelling has also been used to form compounded names for more than 80 genera, as in Amblyolejeunea Jov.-Branch. This situation prompted Grolle (1973) to propose conservation of the name with the spelling Lejeunea, which was accepted. 2 Further research is required to establish whether or not Bory mentions Libert in his unpublished letters (Lacroix 1916, p. LVI). 3 Leptomitus libertiae C. Agardh is now known as Leptomitus lacteus C. Agardh, a fungus-like organism in the Kingdom Chromista. 4 Libert had also received a copy of the Mémoire sur les lichens calicoïdes. Première partie. Description des genres limboria et cyphelium. Par Erik Acharius. Traduit du suédois par Auguste Le Prevost from Desmazières, with the following dedication “A Melle Libert, de la part de son dévoué serviteur et ami, H. Desmaziere [sic]” (To Miss Libert, from her devoted servant and friend) (Federal collection Meise Botanic Garden, inv. no. 5324). Sara MAROSKE, Susan JANSON & Tom W. MAY, «JEAN-BAPTISTE BORY DE SAINT-VINCENT’S SET OF PLANTAE CRYPTOGAMICAE ARDUENNA AND THE IMPORTANCE OF MENTORS AND MODESTY IN MARIE-ANNE LIBERT’S CRYPTOGAMIC CAREER (suite 1)», Lejeunia, Revue de Botanique [En ligne], N° 198 (décembre 2018), URL : https://popups.uliege.be:443/0457-4184/index.php?id=1339.